A FULL-PAGE advertisement from Mr Sim Wong Hoo, chairman and CEO of Creative Technology, paying tribute to the late Apple co-founder Steve Jobs, has created some buzz. 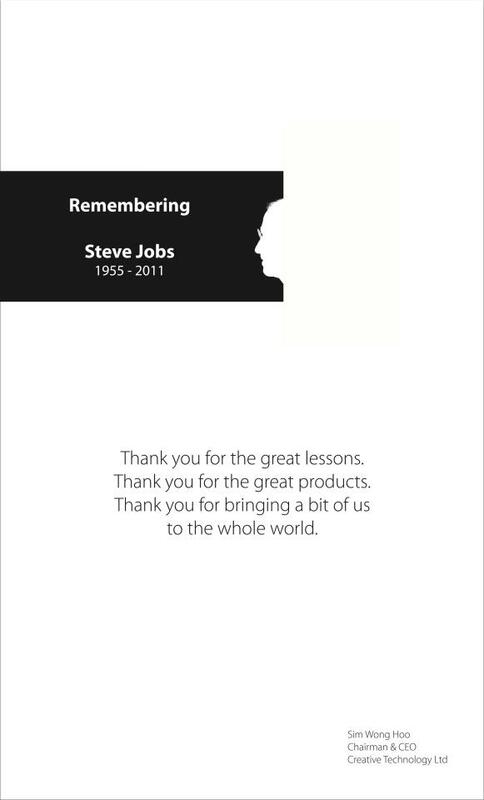 The ad, which cost a five-figure sum, appeared in The Straits Times' yesterday, had the text "Remembering Steve Jobs 1955-2011" sitting on a black box which had one side framed by Mr Jobs' silhouette. Further down, it read: "Thank you for the great lessons. Thank you for the great products. Thank you for bringing a bit of us to the whole world." Mr Sim signed off below. The last line "bringing a bit of us to the whole world" serves as a reminder of the legal tussle between Creative and Apple on the ZEN interface patent. Most of our would remember several years ago, Creative and Apple were locked in a patent dispute, which ended with Apple settling the matter by paying Creative US$lOO million. Mr Jobs, 56, died last Wednesday of respiratory arrest caused by a pancreatic tumour. No matter what, its still nice of Mr Sim say such things after what damage Apple had done to Creative after the MP3 war.